The Rock Solid PowrGrip® 4.5 for Wallee iPads, Tablets and DSLR & Video cameras is designed to be the most secure and versatile vacuum mounting system available. The Rock Solid PowrGrip® 4.5 for Wallee iPads, Tablets and DSLR & Video cameras is designed to be the most secure and versatile vacuum mounting system available. The vacuum cup is made by industry leader Wood’s PowrGrip, who has been manufacturing highest quality vacuum lifting and mounting equipment since the 1960s. The Rock Solid PowrGrip 4.5 includes a Ballhead Assembly to angle the connected device to just about any position. The PowrGrip attaches and releases in seconds and can be moved quickly from one place to another on autos, RV’s, boats, cockpits, windows, mirrors, counter-tops or any smooth, non-porous surface. The rubber pad won’t mar or damage most surfaces. 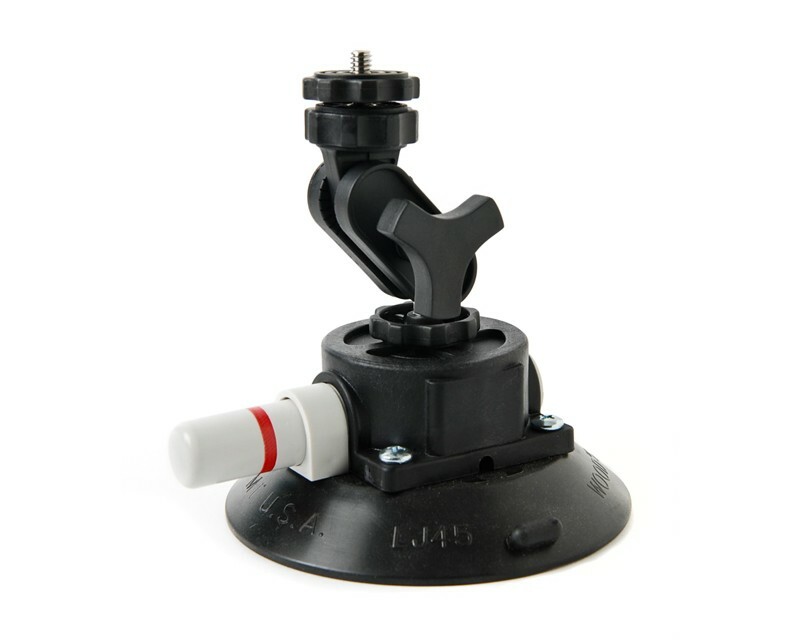 Unlike a suction cup mount that is pressed onto a surface and then creates a seal by pulling away from the surface, PowrGrip vacuum cups use a hand-actuated pump to efficiently remove air from between the rubber pad and the attaching surface, creating a much more reliable, longer lasting hold. This is the same mounting technology used on commercial film or photo shoots and the same solutions employed for industrial uses such as transporting large pieces of glass and mirrors. Because the full face of the pad is brought into contact with the surface, distortion is reduced, allowing the cup to be used on materials of almost any thickness with minimal risk of damage. A spring-balanced pump ensures a consistent vacuum level and the red-line indicator warns if there is any drop in holding power. Just a few pumps of the plunger will remove the air from between the mount’s vacuum pad and mounting surface. As long as the mount maintains a reliable hold, the plunger remains partially hidden inside the pump and the red line is not visible. If the red line appears, another pump or two will restore full holding power. To release the vacuum cup, push on the rubber tabs at the edge of the pad and the mount will release from the attached surface. The Ballhead Assembly’s 1/4″-20 stud easily attaches to a iPad positioned in a Wallee Case and either the Connect or Connect Lite bracket, the AeroTab or any point & shoot, DSLR, or video camera that has a tripod mount. To secure an iPad, a Wallee Case and Connect or Connect Lite bracket is needed (sold separately) or use the AeroTab Universal Tablet System.